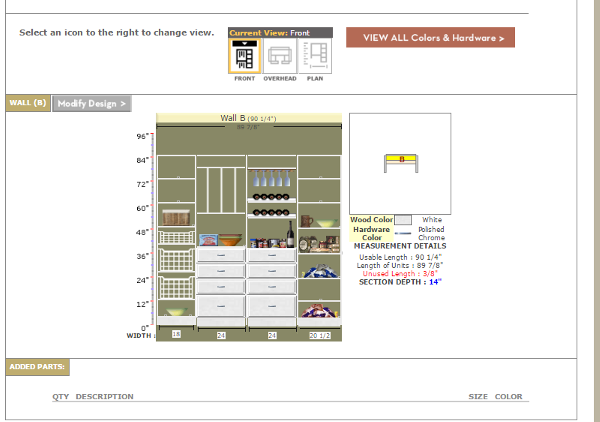 Designing A New Pantry Organizer with EasyClosets. We have been living in our house for a little over a year now. While we have made a few fixes and upgrades to our 1960 farmhouse, there is still a lot of work to be done. One area of the home that I have been dying to upgrade, is our pantry. We have a fairly large pantry but, with only three shelves, it lacks in storage. Here is a look at our pantry in its current state. Look at all that wasted space!! There is two feet of space between each shelf and nearly three feet of wasted space under the bottom shelf. I love our large pantry but the lack of shelving was not working for me. Something had to be done. The side walls of our pantry are original to the home. I'm not sure exactly how they built houses in the 1960's but our walls are almost a foot thick!! This means that our home is very well insulated. (Yay!!) It also means that we can't find a single stud in any of the original walls which makes it very hard to hang pictures or install shelves. (Boo!!). My husband and I have few ideas for what we want to do with those walls but for now we are just going to focus on the back wall which is not original to the home and built like a normal wall. You know... the kind of wall with studs every 16 inches that make it a lot easier to hang shelves. For the past couple weeks I have been working with EasyClosets to design my pantry. When it comes to home renovation projects, the planning phase is by far my favorite part. EasyClosets showroom gallery was a great place for inspiration for planning my space. Check out these beautiful spaces! 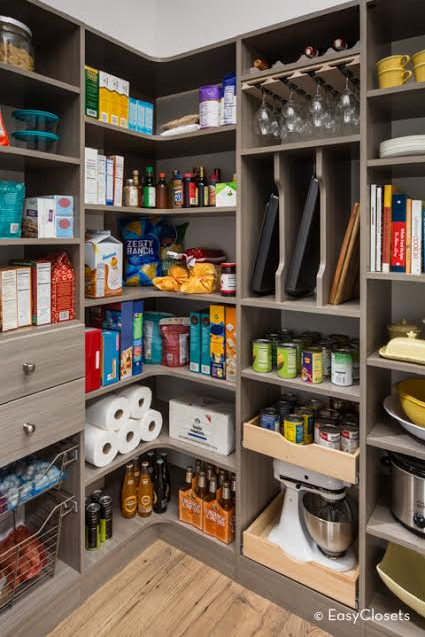 I never thought of including drawers in the pantry until I saw them in a few of the photos in the EasyClosets showroom gallery. It occurred to me that one of the biggest issues I've had with every home I've lived in (including my current home), is not enough drawer space in the kitchen. So why not include drawers in the pantry? I also loved the look of the baskets that you can see in the photo above. Unlike the drawers, you can see what's inside the baskets without opening them. Perfect for snacks and produce! I started out by making a list of what I wanted to include in the space. Here is what I came up with. A place to store our sheet pans, baking dishes, and cutting boards to free up some much needed cabinet space in our kitchen. 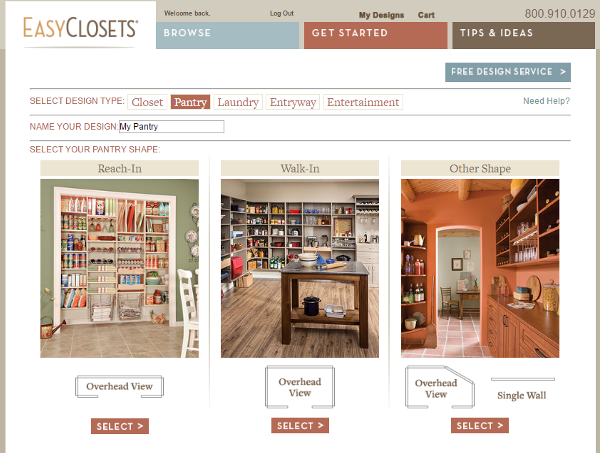 Once I logged into EasyClosets.com there were many different rooms and designs to choose from. 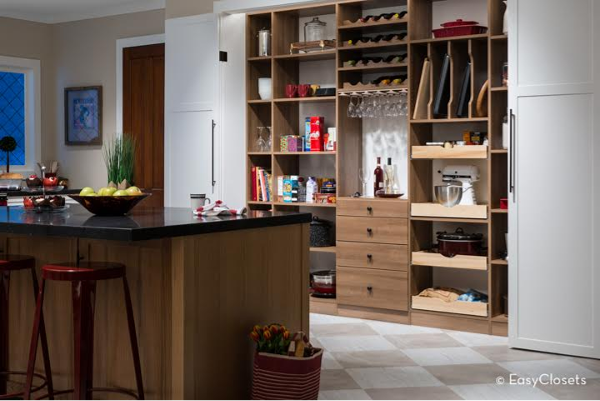 After selecting the design that best fit my space and entering my pantry measurements, EasyClosets set me up with a recommended design. If you're looking for something basic and you are happy with the recommended design then you can purchase it and be done! It really is that easy. You can see in the photo below, the recommended design for my pantry. I love the amount of shelf space in this design. It is a huge step up from my current pantry shelves. 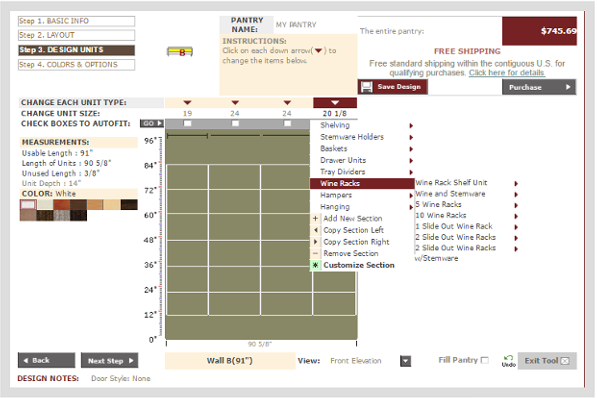 Even if you're not in the market for a new pantry organizer or closet system, I highly recommend checking EasyClosets online design tool. It is so much fun to check out all the possibilities and it's completely free to use. Join me next week as I take you through the installation process! This is a sponsored post. 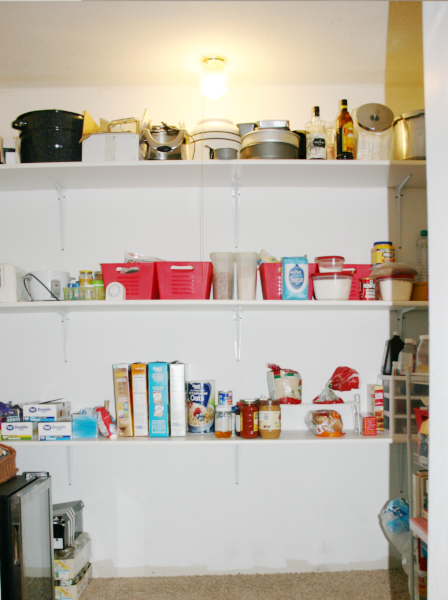 EasyClosets has provided me with a free pantry organization system in exchange for an honest review. All opinions are 100% mine.